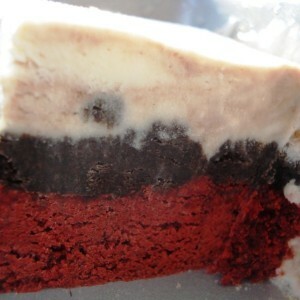 The Mint Red Velvet Brownie Ice Cream Cake is not that complicated to make, and is AHHHHHH-MAZING! Preheat oven to 325 degrees F. Combine cake mix, melted butter, eggs, pudding mix, vegetable oil and mix well until thoroughly combined (2-3 minutes in my kitchen aid). Spray a 9x13 with nonstick cooking spray and dust pan with flour. Spread the brownie dough in the pan. Note: it is very thick and may need to be pressed more than spread. Bake for 20-22 minutes or until a toothpick comes out clean. Let cool completely overnight. While the brownies are baking, you can start making the ice cream! In a small bowl, mix together 2 tablespoons of the milk with the cornstarch and whisk until smooth. Set aside. In a large bowl, whisk together the softened cream cheese with salt. In a large saucepan (I use my 6 quart), add milk, cream, sugar, and corn syrup, whisking together. Bring to a boil over medium-medium high heat. Watch closely as it might boil over! Boil for 4 minutes, stirring occasionally. Remove from heat and slowly add the cornstarch mixture while whisking slowly. Bring back to a rolling boil stirring until it thickens slightly, 1-3 minutes. Remove from heat and slowly combine with large bowl with cream cheese mixture. Whisk between each addition until smooth. Cover and let cool in the fridge overnight. Lastly, I prepared my hot fudge sauce. In a medium sauce pan, whisk together all of the ingredients over medium heat. Whisk until mixture starts to boil, but don’t let it boil over either! Remove from heat, cool completely and store in the fridge. Once the ice cream mixture was cooled (I leave it in the fridge overnight), prepare according to manufacturer directions. I churned for about 25 minutes. After 10 minutes I added the vanilla and mint extract. While the ice cream is churning, crush the entire package of Oreos. I crush them in a bowl with the bottom of a cup. Melt cream cheese for 15 seconds in the microwave to soften. Combine with Oreo cookies. Now the assembly: Spoon and press out Oreo mixture on top of the cooled brownies. The brownies stick easily, so it is best to press and not spread. When the ice cream is done, I spooned the fudge ripple into it and swirled a few times. Beware not to swirl it too much before you layer the ice cream onto the brownies or it will be more of brown ice cream than a swirled ice cream! Freeze until ice cream is firm and enjoy!! !